The Carver One, a unique, Dutch built, two-seater tilting, three-wheeled vehicle combining the agility of a motorcycle with the comfort and safety of a car, will make its UK auction debut at Manheim Auctions, Mansfield on the afternoon of Tuesday, 10th August. Reputed to be one of only 30 examples in this country, the 2008 (58 plate) matt black Carver One has covered just 4,865 miles since new. 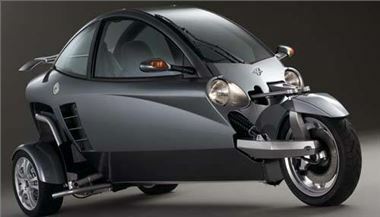 The Carver One is a three-wheeled, two-seater tilting vehicle that is steered like a car but reacts just like a motorcycle. Unlike a motorcycle where the rider adjusts the tilt angle by shifting their weight, the Dynamic Vehicle Control (DVC™) system of the Carver One automatically adjusts the tilt angle to the speed and acceleration of the vehicle, thus ensuring optimum balance at all times. Powered by a turbocharged four-cylinder 660cc, 16 valve rear-mounted 68 bhp engine with a five-speed gearbox, the Carver One goes from 0 to 60 mph in 8.0 seconds and reaches a top speed of 115 mph. An enclosed cockpit structure seats the driver and passenger in a tandem configuration. The removable body-coloured roof panel, alloy wheels, sports interior and design aluminium accents are part of a comprehensive standard package. Each Carver One can be personalised through additional options such as metallic or special paint, leather seats and engine tuning. Manheim Auctions, Mansfield is located at Fulwood Industrial Estate, Common Road, Huthwaite, Sutton in Ashfield, NG17 6AD. More information can be found at www.manheimremarketing.co.uk. Postscript 11-8-2010: The Carver 1 sold for £15,200.